I set up my first Twitter account about eight years ago, and have been using it consistently for approximately the last four. I have additional accounts for school and my class, and last night I created a new one @makingnmarking (makingandmarking was too many characters, sadly). Please feel free to follow me, as I am looking to expand my network of fellow sewists. 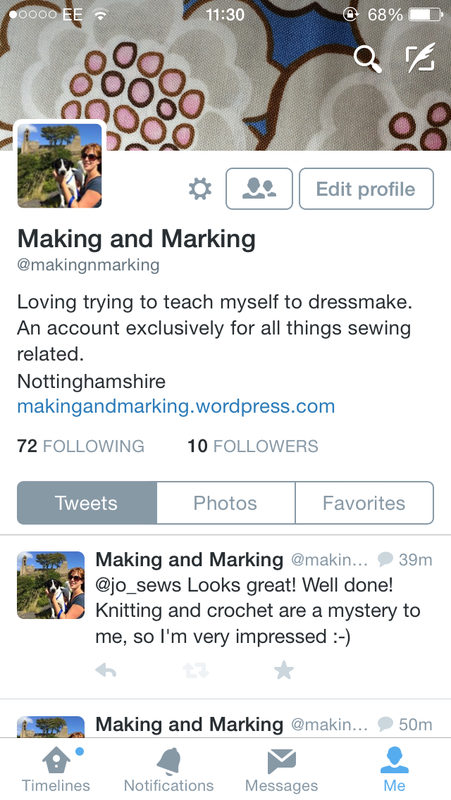 I created the account so I could separate out all tweets relating to making. No school, no (ok, minimal) dogs and personal updates centred around sewing. I immediately followed some of the suggested accounts, and this morning I stumbled across a retweet that originated from @lnathangoucher. It linked to a blog post about a link up, where participants will basically take part in a sewing-themed Secret Santa. Amazing! Items can be bought up to the value of £10, excluding postage. Lisa has even helpfully includes last posting dates to ensure Christmas delivery. My mind is already whirring. I know I would like to send several smaller items, but I’m wondering, if you could choose to find any items in your #sewingsanta, what would they be and why? Ps: sign ups for #sewingsanta end on October 31st, so hurry if you would like to join! Dreaming of all sorts of kit!! Maybe a length of vintage fabric or some kitsch buttons! Basically happy with anything…there’s no way I’ll get a sewing-related present without #sewingsanta!! You should! It sounds great doesn’t it? 😭😭😭😭😭 I got so excited reading this post but then it’s UK only silly American trip hhmmph! Funnily enough, my friend Nat at threadsandbobbins.wordpress.com lives in the US and was saying she would love to take part – I wonder if you two could sort something between you? Fantastic! It looks great doesn’t it? !